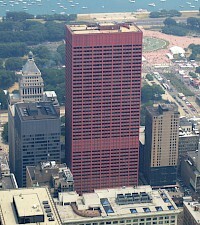 CNA Center is a 600-foot (183 m), 44-story high-rise building located at 333 South Wabash Avenue in Chicago. CNA Center is a simple, rectangular International Style building, but it is unique in that the entire building is painted bright red, turning an otherwise ordinary-looking structure into one of the most eye-catching buildings in the city. It was designed by the firm of Graham, Anderson, Probst & White and was completed in 1972. The Everett McKinley Dirksen United States Courthouse, sometimes referred to as the Dirksen Federal Building, is a skyscraper in downtown Chicago, Illinois, at 219 S. Dearborn Street. 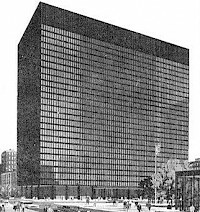 It was designed by Ludwig Mies van der Rohe and completed in 1964. The building is 384 feet (117 m) tall, with 30 floors; it was named for U.S. Congressman and Senator Everett Dirksen. 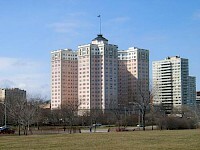 The Edgewater Beach Hotel was a hotel in the far-north neighborhood community of Edgewater in Chicago, Illinois. Built in 1916 and owned by John Tobin Connery and James Patrick Connery, it was located between Sheridan Road and Lake Michigan at Berwyn Avenue. The complex had a private beach and offered seaplane service to downtown Chicago. The Elysian is a hotel in Chicago, Illinois. Located on East Walton Street in the Gold Coast, The Elysian is a luxury hotel boasting 5 star amenities including a spa. The Elysian also has 52 private residences, condos, most of which are worth well over $1 million. Marc Jacobs also has a store in the bottom level of the hotel for his line of clothing and accessories. Four Seasons Hotel Chicago is a part of the Toronto-based Four Seasons chain of luxury hotels and resorts. Four Seasons Hotel Chicago, an American Automobile Association (AAA) Five Diamond and Mobil Five Star hotel, offers one of Chicago's best restaurants and lounges, according to Condé Nast Traveler. It is located in the heart of downtown Chicago overlooking Lake Michigan. Built in 1972, Harbor Point Condominiums is a residential and commercial building in Chicago, Illinois on Lake Michigan. 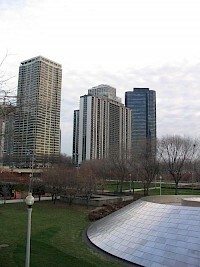 The building has views of both Grant and Millennium Parks and sits on Chicago's Monroe Harbor.